A Brutalist Bertrand Goldberg building is getting painted. Preservationists aren’t happy. 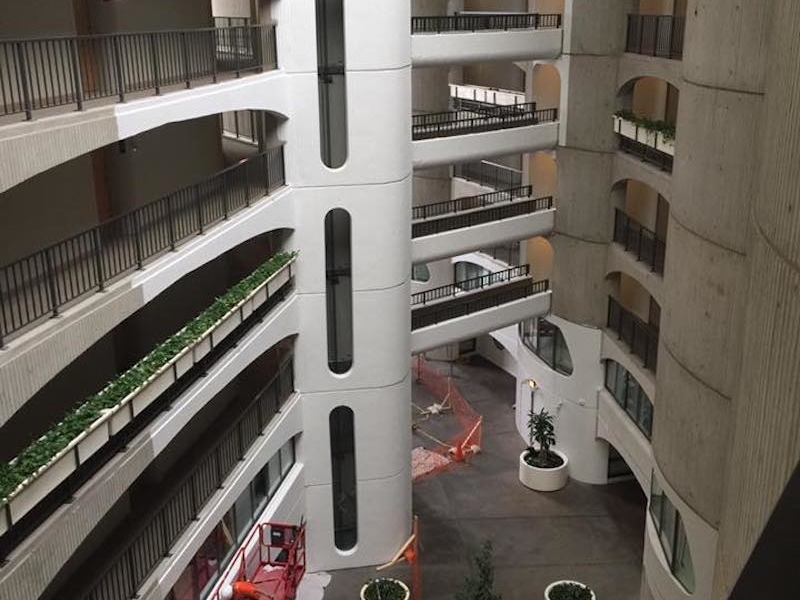 A firm that purchased the River City condo complex in bulk last month for conversion to rentals is starting a significant change to the building, designed by late modernist architect Bertrand Goldberg: a crew is painting the exposed concrete walls of the building’s interior atrium white. A crew began painting white over the exposed concrete walls of the building's 10-story atrium, which the architect envisioned as a sunlit interior street. "It's a shame," a Chicago architecture critic said. Ugh. You don’t paint brutalist buildings. Why why why? Why include a link that requires a subscription to read? The reason they call this a brutalist building is because its brutal to look at. They painted the steel in the Ogilvie building; maintenance disasters forthcoming. This current decor trend of making everything white has already ruined a couple of formerly beautiful atriums/lobbies in downtown. The Union Carbide building comes immediately to mind. Now it looks like an E.T. spaceship has landed. Painting concrete white 😂, that’s the same mind set that had people when they installed asbestos tile over hardwood floor, painting ornate wood moulding, this is just dumber and at a larger scale, good luck reversing it future generation. Such a creepy building. The halls are scary. ID channel. Fix it. How’d this happen? Why not add some shiplap too? That’d really spruce it up. They’ll strip back in five years to “restore” it. Isn’t there a better use of resources? Looks like a big improvement. Keeping it clean may be an issue but the look is nice. They are ruining it. Can something be done? City should not allow this. So ridiculous. This is one of my favorite buildings in the city! I’d have taken a serious look at a lighting update over paint that transforms an iconic work into 1980’s mall architecture and will be a maintenance disaster. Who owns the building? Issue resolved. Is this done out of simple ignorance? Or is it willful/malicious bad decision making? Is this a landmark building? If not, then nobody can do anything to stop anyone from doing anything they want as long as it does not create a code violation. This link is about the building it replaced which should have been landmarked and saved for an adaptive re-use (just like Dearborn Station). The article describes the history of the business-side of the station which is what led it to its demise. No building is safe if it is not landmarked and if it’s a money pit with no hope of profitability. I worked for Bertrand Goldberg on this project.It IS NOT BRUTALIST ARCHITECTURE! There is no such thing as “brutalist” architecture. That is just a word/title that a British architectural critic, that did not like exposed concrete buildings called those buildings.He was NOT an Architect. The new owners are stupid to do this, the maintenance of this will be huge. If it was intended to be painted, it would have been painted orginally……Once again, real estate people expose their gross ignorance of the property they own. Bertrand Goldberg never referred to this as “brutalist”, none of us that worked on the building referred to it as “brutalist”, therefore , IT IS NOT BRUTALIST!. So… painting to make it look like a parking garage now? I’m continually shocked by how ignorant people in general are about architecture and design. Not surprising since we don’t really teach anything about appreciating it in the grade schools curriculum, except in small exceptions here and there. I’m constanlt arguing with rubes who can’t understand the interplay of space and form, and insist that volumetric space you can’t occupy is always “wasted space”. I ask them if that means they live in a box with 6-foot-three-inch ceilings and how they like the “efficiency” of that. People that don’t understand how bare concrete can have an intrinsic beauty, just exasperate me. I prefer to see this building the way it was imagined and executed. Everyone is entitled to their opinions re taste, but even if you do not like it, one has to consider whether outside of personal aesthetics the building is successful. The whole point of “exposed concrete” as an concept is to leave it unadulterated. Thank goodness Unity Temple is safely protected. Why would they paint it??! !